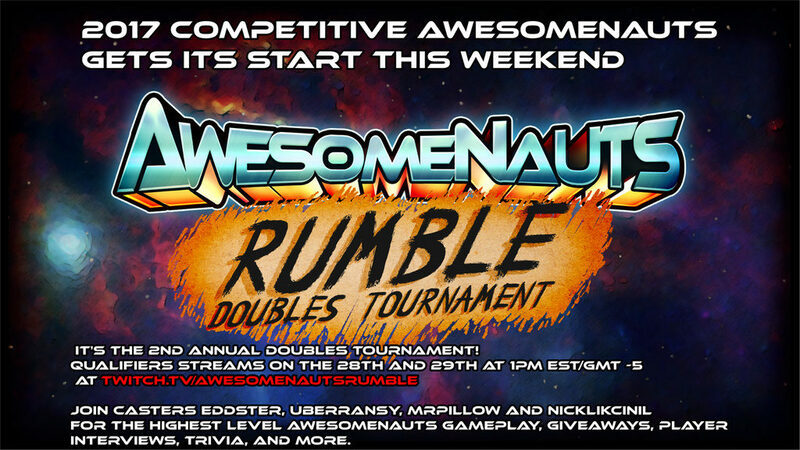 Tune in to the Awesomenauts Rumble Doubles shows this weekend! Tune in to the shows covering the Awesomenauts Rumble Doubles qualifiers this weekend! Matches will be covered on both Saturday and Sunday, starting at 19:00 EU / 18:00 UK / 1PM ET / 10AM PT over at Twitch.tv/AwesomenautsRumble. In this tournament, teams of two players face off in otherwise-regular Awesomenauts matches! 2v2 matches result in some really surprising gameplay and incredibly powerful pushes, so events like these are a ton of fun to watch and play! Big thanks to MrPillow, Uberransy, Nicklikcinil, and Eddster for hosting these shows, and to the entire Awesomenauts Rumble Doubles team for making this event happen.